This new source of information not only provides interesting information on the rise and fall of the Rohila chiefs in Katehar region (Rohilkhand) but also is the first one ever written in Janbhasha (prose). Besides the rise of Jat power under Mahraja Suraj Mal, the conflict between the Bangash Pathans of Farrukhabad and the Wazir, Safdar Jung, the third battle of Panipat fought between the Marathas and Ahmad Shah Abdali, the treacherous role played by some of the allies of the Marathas and Najib ud- Daula’s relations with Suraj Mal and the Maratha chiefs, also receive detailed treatment. This work being the first history of the Rohila chiefs of Katehar not only serves as corrective to Persian histories but also contains much of importance for those who are interested in the history of the progress of the regional dialect called Hindwi out of which evolved the modern Urdu and Hindi languages. If the text is transferred from its Urdu script into that of Devanagari, it will be taken as the first book ever written in Hindi prose. Iqtidar Husain Siddiqui is a retired Professor of History, Aligarh Muslim University, Aligarh. Rustam Ali Bijnori’s account of the rise and fall of the rohila chiefs in the region of Katehar (modern Rohilkhand in western UP) is not only a contemporary work but also an early example of vernacular chronicle. It is the earlist history written in the dialect called Hindwi out of which evolved the modern Urdu and Hindi language. Being a specimen of written Hindwi, it serves as a useful source in tracing the origin and progress both of Urdu and Hindi prose literature. No doubt, the central character is Ali Muhammad Khan, the adopted son of Daud Khan Rohila, an emigrant adventurer from Roh (the ancestral homeland of the Afghan tribes), but the work is richly informative in a much wider sense. It is enlivented by short anecdotes, at times heroic and sometimes more down to earth, about other participants such as Newab Dunde khan, Najib ud- Daula, his son, Zabita Khan and the Bangash nawabs of Farrukhabad, besides Hafiz Rahmat Khan. It clearly depics the privations and suffering of ordinary people caused by the Marathas, Safdar Jung, invasions of Ahmad Shah Abdali and the Anglo- Rohila war of 1774. Rustam Ali Bijnori also displays remarkable knowledge of contemporary weapons of war such as bans (rockets), different types of artillery along with the traditional sword, spear and arrow. Being both a literary artifact and a historical record, it throws up new evidence in support of the progress of Urdu and Hindi languages and offers a much needed counterbalance to the Persian histories that display a partisan character. The discovery of this work is important for scholars of Urdu/Hindi literature as well as historians. The history of the decline of the Mughal Empire during the eighteenth century is marked by a struggle for political power among the governors, land potentates (big zamindars) and other adventurers. The dwindling financial resources of the Empire made it difficult for the emperor to maintain the grandeur of his court. Scholars, poets and men of talent who depended on royal patronage for their livelihood were forced to move to the provincial headquarters where the subedars had become independent for all practical purposes. These new rulers not only retained the existing system of governance, but also emulated the great Mughal emperors in promoting culture. Even the Rohila chiefs who had come to India as adventurers in search of fortune and established their rule over the fertile region of Katehar did not lag behind in this respect. Though the Rohilas had no pretensions to learning and aristocratic culture, they adopted the best of the Mughal culture and polity within a short time. They evinced interest in founding educational institutions in towns and cities, patronized men of learning and arts and instituted welfare measures for the benefit of the people they ruled. It was the prosperity and resourcefulness of their territory that enticed the nawabs of Awadh to destroy the Rohila chiefs and annex their territory to Awadh. Safdar lung suffered a humiliating defeat and died a frustrated man. His successor, Shuja ud-Daula first established friendly relations with the Rohila chief, Hafiz Rahmat Khan and then destroyed his power with the help of the British army. Following the annexation of Katehar to Awadh, Shuja ud-Daula utilized the services of the British army officers stationed at Katehar to keep the people there under control. The English officers posted in the captured territory were apparently impressed by the popularity of the Rohila rulers among the people. The people of Katehar had prospered under their care. A British officer in Daranagar commissioned Rustam Ali Bijnori, who was employed to teach him Hindi/Urdu dialect to compile the history of the rise and fall of the Rohilas. A word may be added about Rustam Ali Bijnori. As his name suggests, his hometown was Bijnore in Katehar (now headquarters. of the district of Bijnore). No tazkira (biographical dictionary) of the eighteenth or nineteenth century Urdu poets and writers yields any information about him. It may, however, be stated on the basis of his history that he belonged to an ashraf (elite) family of the town and may have been rendered jobless after the collapse of the Rohilas in 1774. Two years later, he was employed by lohn Haurs Ford, an officer in the British army popularly called by Indians, Spat Sahib Bahadur to teach him 'Hindi/Urdu'. Though he felt secure and was relieved of the worry of livelihood, he could not use harsh language against Safdar lung and Shuja ud-Daula for their treachery against the Bangash nawab of Farrukhabad and Hafiz Rahmat Khan Rohila because Katehar had been annexed to Awadh and witch- hunting had begun. The land grantees were deprived and left without any means of livelihood. Rustam Ali's nostalgia is discernible in his work written between the lines. It may be added that he was a non- Afghan shaikhzada free from Afghan chauvinism. 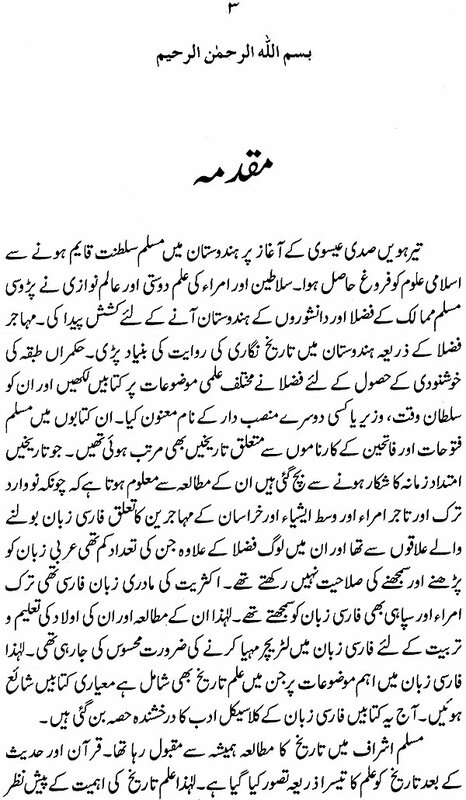 He was able to produce a history of Katehar under the Rohila chiefs without any pro- or anti-Afghan bias. The rejection of unnecessary details even for the sake of embellishment make his work unique in the history of history writing in pre-modern India. However, Rustam Ali's compilation is the earliest work on the rise and fall of the Rohila chiefs of Katehar. Unlike him, other contemporary writers associated with the nawabs of Awadh, the Mughal court at Delhi or even Warren Hastings failed to write objectively. Their works were written in accordance with the likes and dislikes of their patrons, portraying the Rohilas in a poor light. Their narratives read as official history while Rustam Ali's history is non-official history, marked by objectivity in his approach. In highlighting its comparative value, it is worthwhile to briefly analyse the approach of a few important writers whose works also contain information on the Rohila rulers. The first work is the Siyar ul- Mutakhirin compiled by Ghulam Husain Tabatabai, an Irani by origin. His father Hidayat Ali was related to Ali Wardi Khan Mahabat lung, the subedar of Bihar and Bengal. Initially, Hidayat Ali served Ali Wardi Khan in Patna. In 1746 he left for Delhi to join Ghazi ud-Din Khan Firuz Jung. The latter sent him to Bareilly to manage his jagir there. Following the return of Ali Muhammad Khan with his Rohila army from Sirhind in 1748, he found the situation uncontrollable and returned to Delhi. Ghulam Husain also served under Saulat Jung, the son-in-law of Ali Wardi Khan in Bihar till 1756. In 1759, he joined Prince Ali Gauhar (later Shah Alam II) when the latter was struggling to seize Bihar and Bengal. Upon Shah Alam's failure, Ghulam Husain acted as liaison between the Indian rulers and the English officers of the East India Company. He won over many English officers. Warren Hastings liked him for his ability to write Persian prose in a beautiful style.' His Siyar, ul-Mutakhirin covers the history of India from 1707 to 1781. As his father was driven away by the Rohilas from Bareilly in 1748, they are not given a fair treatment in his work. The similar is the case with the writers associated with the nawabs of Awadh and Shah Alam II. In contrast to the above-mentioned histories, the writers associated with the Bangash nawabs of Farrukhabad are more objective in their narration of historical events. Among them, Newal Rai and Hussam ud-Din Gwaliori describe the events of their times briefly in the Tarikh-i-Ahmad Khani and the Tarikh-i-Muhammad Khani respectively. After them Saiyid Muhammad Waliullah compiled the Tarikh-i-Farrukhabad that contains a detailed account of the Bangash nawabs and their relations with the Mughal court at Delhi and other contemporary rulers. The Gulistan-i Rahmat compiled by Nawab Mustajab Khan, the son of Hafiz Rahmat Khan in 1792-3, is a detailed biography of Hafiz Rahmat Khan. 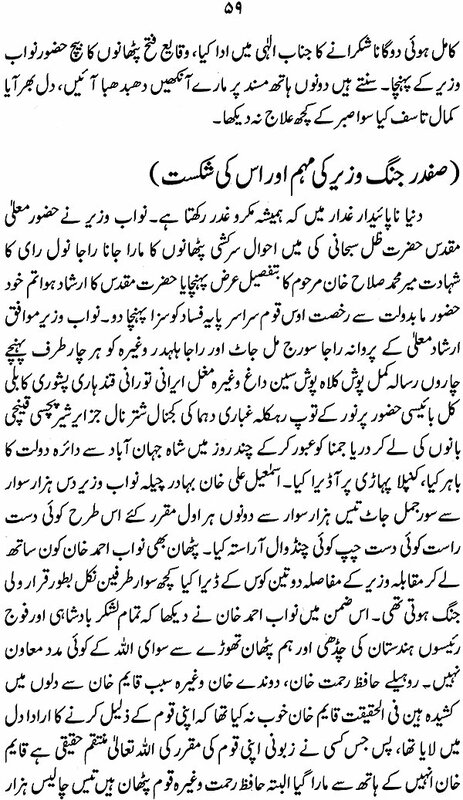 In this work only Hafiz Rahmat Khan's achievements are highlighted whereas those of the other Rohila chiefs are almost ignored. Daud Khan who laid down the foundation of Rohila power in Katehar, is described as the murderer of his master, the father of Hafiz Rahmat Khan." In 1833-4, Muhammad Sa'adat Yar Khan, the nephew of Mustajab Khan, completed his Gul-i Rahmat, an enlarged version of the Gulistan-i Rahmat. 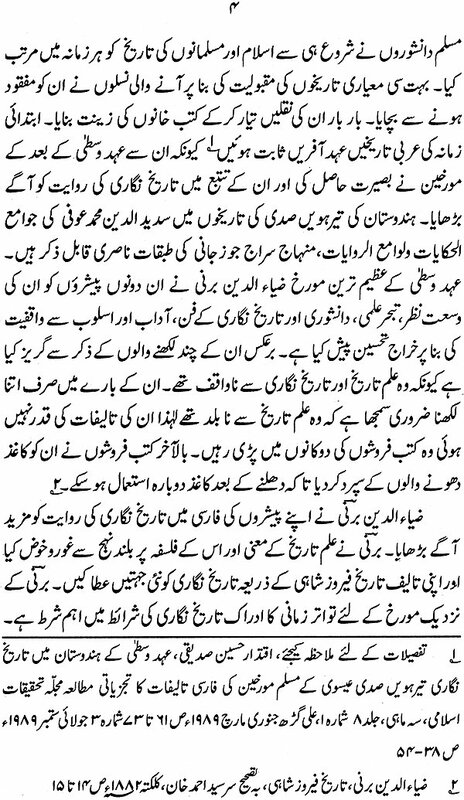 Besides these works, the memoirs of Tahmas Beg Khan also contain interesting details about the events related to the history of Rohila chiefs. The author served in the army of Muin ul-Mulk in the Panjab and then joined successively the service of Zabita Khan and Najaf Khan. Though his work is largely a personal narrative, it contains an account of the events in which he was involved or to which he was an eyewitness. It is noteworthy that in his memoirs, Tahmasnama, whatever information has been given has corroborative importance. The details furnished by him about Najib ud-Daula's relations with the Maratha chiefs and Hafiz Rahmat Khan's relations with Shuja ud-Daula corroborate the unbiased account of Rustam Ali Bijnori.' 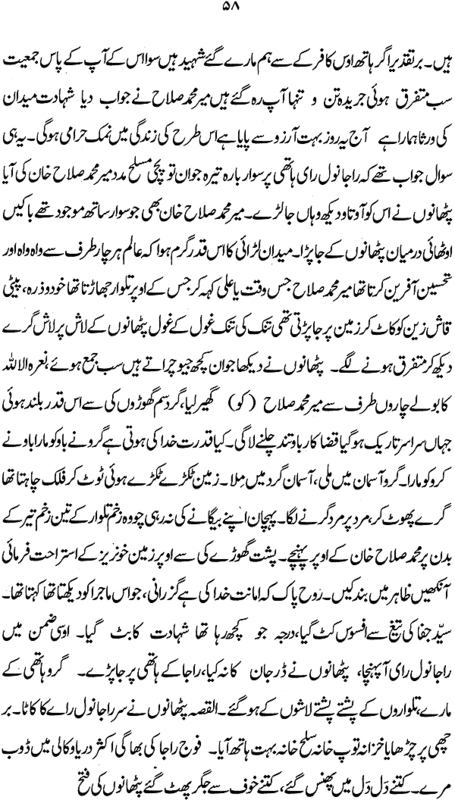 According to Tahmas Beg Khan, Shuja ud-Daula deceived the Rohila chiefs. All of them were assured of a fair deal. Zabita Khan was promised the territory of Hafiz Rahmat Khan for his support, but all of them suffered after the fall of Hafiz Rahmat Khan. Zabita Khan was able to save himself from the tyranny of Shuja ud-Daula by seeking refuge under Najaf Khan. Of all the histories compiled during the latter half of the eighteenth century, Rustam Ali's history is an objective account. Every man who played a historically important role has been portrayed impartially. It also provides insights into the social relation between members of different religious communities and ethnic groups, the rivalry between the Turani and Irani nobles at the court in Delhi, the role of zamindars in various territorial divisions of Katehar. The verbal portraits of important persons are authentic as substantiated by the circumstantial evidence from other sources. For example, Najib ud-Daula, who rose from the position of a sawar to that of a high mansabdar of the Mughal emperor, is presented as a man with leadership qualities. Rustam Ali has gone to great lengths to verify the authencity of evidence he collected about any historical event. The new administrative terms that were introduced during the latter half of the eighteenth century are mentioned along with the old ones that were still in use. It contains references to the sarkar (an extensive territorial unit) and zila" (district) indicating that the vast sarkars were divided and reorganized into smaller units for administrative convenience and economic development. Moreover, in every principality a large number of nobles of high ranks were trusted with the charge of it separate unit called a zila, independent of each other. Thus, the zila of north India was not the creation of the British administration. The other important term introduced during this period is jaidad instead of jagir. Rustam Ali Bijnori begins his account with Daud Khan, the founder of Rohila power in Katehar, He was a slave of Hasan Khan Bharaich, one of the Rohila chiefs. He ran away in his youth and joined the army contingent of Nasir lung, the Mughal mansabdar, posted in Peshawar. Daud Khan managed to save Rs. 2,000 over a period of two years and decided to try his luck in Delhi. He purchased -horses and arrived in Delhi. After a few months in Delhi, he went to Shahabad where the local chief, Raja Madhkar, popularly known as Madar Shah employed him. Impressed by his courage and martial qualities, the raja encouraged him to recruit soldiers and organize a force. Daud Khan employed around 200 or 300 soldiers and sup- pressed the anti-social elements in his zamindari (feudal estate). He also forged friendly relations with the raja of Kumaon by sending him expensive gifts. After the death of Raja Madhkar, he went to Almora and joined the service of Raja Deep Singh of Kumaon. Raja Deep Singh entrusted him with the charge of the entire territory in the foothills of Kumaon hills, yielding Rs. 13,00,000 per annum.